*note: I adore and endorse the craftsmanship of Pyrate Leatherworx. However, I’ve received many reports of late from dissatisfied customer regarding poor communication and long overdue orders. Prior to placing an order based on this review, I strongly urge you to first read these comments from concerned readers. Too many times I’ve attended pirate events, had a fantastic time, and then come home to grumpy emails from readers saying, “I didn’t know you were at [Pirate Festival]! I was there too – I’d have bought you a rum!” Now, I’m not the sort to walk up to everyone and say, “Greetings, I am Bilgemunky – perhaps you’ve heard of me.” (Actually, I’d gladly do this, except for the fear of them saying, “No – now please leave me alone.”) But I’m also not the type to pass up the opportunity for readers to buy me rum. What to do? At the time of this writing there are only two hatcrafters that I would deem worthy of making such a hat – and I just happened to be drinking with the crew of one of them when I first had the idea (drinking rum I had purchased myself, I might add.) I mentioned my interest in such a hat, and we mapped out a rough sketch together. And a short, crikey-knows how many months later, a box arrived at my doorstep. The hat is, in a word, glorious. Pyrate Leatherworx had captured the dream I sketched out, and turned it into a hat of unimaginable beauty. My request had been for a black, front-fold hat with feathers projecting at an angle from the center, and stradled by the Bilgemunky logo. And this they did in full – the logo was a perfect rendering (always a concern, as I’d have trouble if the logo looked at all “off”), and the feathers were a billowing cascade that could make any pirate look conceited and self-important. Pyrate Leatherworx threw in the additional touch of a white band around the trim, and the entire hat is lightly beaten and aged so as to look in great shape, but not too new. The hat looked great, and it fit great. But did it work? I found out at PyrateCon, where indeed, more than one fellow pirate saw the Bilgemunky Logo atop my head and then ordered me up a rum. It was a wonderful, wonderful thing. This entry was posted in Clothing and tagged bilgemunky's favorites, custom work, hats, pyrate leatherworx, pyrate trading co. by Bilgemunky. Bookmark the permalink. I bought one of the pyrate.org hats, & it is not only awesome but quite affordable. I highly recommend them! Ordered from this site and never received the product. Never got a refund. Horrid communication from webmaster. If I ever see them I’m making them walk the plank. Order from someone else. Got my refund finally after I don’t know how many emails. They seem like a nice group of people that just have some things to learn about customer service. Although, being Pirates, I guess that might be a bit of a stretch. Anyway, please disregard my last post. I like their product set, just seemed to be a bad time for them so my order couldn’t get processed. Ordered a hat from them on October 6 of this year…here it is Christmas….no hat, no refund, and no response from them. I placed a 200$ order the 1st of Oct. No product and they do not return emails….. Unfortunately I had the same experience. Ordered in April 09. Tried numerous times to email. Even found a mailing address and tried that. Na da. A year later I’m trying one more time to contact them but not optimistic about it. Still no hat as of this writing (May 2010). Recieved one e-mail (after numerous unanswered ones) claiming that they had been delayed by a family emergency, were working on my hat, and would send it immediately…that was months ago. Looking into reporting them to the Better Business Bureau or something of the sort. Finally recieved my hat today after getting the Better Business Bureau involved. As the review above says, it’s well constructed and well worth the money. Unforunately, due to the whole ordeal I (and it sound like many others) have been through with them, I can’t recommend them. Ordered and paid for a hat jan. 2010 never received hat sent numerous email. All ignored. Any help would be appreciated. I likewise ordered from Pyrate Leatherworx, a ‘Blackbeard’ hat in March ’10 with still no delivery as of July. After a pre-order e-mail with Clay regarding sizing and Paypal receipt… nothing. E-mails all ignored, no refund, nothing! I’m very disapointed to say the least. I’m sorry to note that Pyrate Leatherworx has so many unhappy customer these days. While I continue to stand by the quality of their products, there’s little I can say or do regarding these reports of such poor customer service. I’ve sent an email of my own drawing these comments to their attention – with luck (or rather, effort) maybe they can get back on track. Thank you for tossing yer’ hat into the ring on this one. I’ve received an e-mail from Clay at Pyrate Leatherworx explaining a speed-bump that created delays in some of the orders and that they are trying to catch up and complete backorders. He expects to catch up shortly. I had ordered a hat from the pyrate leatherworx on Feb. 9th of 2010. I sent tons of emails and even attempted to get a hold of them on myspace. I got one e-mail in return stating they had “been delayed” and were working on my hat and would ship it out within a week. A month and a half passed, I contacted the BBB, pyrate leatherworx ignored them, until I finally found a phone number, after scouring the net, and called them, asking for a full refund or reporting them to an internet crimes service, which they responded too and issued my refund. 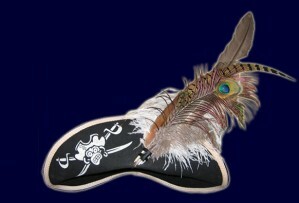 On a much brighter note, after dealing with them, I contacted Jeff MacKay at Captain Jack’s Pirate Hats. After explaining my problem with the pirate leatherworx, he came to my rescue and had a custom Buccaneer hat sent to me within a month. I’d say, if anyone, go with Captain Jack’s, he has great customer service and the quality of the hat is absolutely incredible. I wish I would of read this first. Alas I too ordered a pirate hat the end of july 2010. Got one email from the said Clay saying it would be delivered in Sept. Now it is Oct. Next week is Texas Ren Faire and the Pirate husband will be with out a Hat. I feel scammed right now, and would be very very surprised if this hat showed up. I’ve dealt with Pyrate Leatherworx on many occasions, professionally and socially. While I can’t defend against the slow turnaround times or poor communications as expressed by people in these comments, I’m very confident that there is no malice afoot on their part. Please, do keep on Pyrate Leatherworx regarding your orders and I’m certain they will come through in the end. Granted, this doesn’t fix the problems caused by missed deadlines, but it’s a start. alas I am still waiting….TRF has long since past Sherwood Ren Fest is inc soon. Christmas is here. I feel totally scammed right now. But mostly I feel sad. I have contacted the said Clay at Pyrate Leatherworx at least once a week since the last post. I have gotten a couple emails back with many excuses. I have also asked for a refund many times. I would love the Hat if it is as high quality as others has said but…sadly…there is no Internet Police. i am having same wonderful issues of their crappy customer service and delivery, ordered back in november it is now march and i have no hat. Clay told me a month ago that he would try to get the hat out in the next week well that was a month ago. PLEASE REMOVE THIS HAT REVIEW – After multiple times trying to contact this company they have been completely unresponsive to my requests for my order status. They do not deserve to be on your list of quality vendors. I’m sorry you’ve had a bad experience with Pyrate Leatheworx, Peppercorn, but your request to remove the review is a bit misguided. It is, after all, a *review* and not a “list of quality vendors”, and it’s my duty to report my experiences and observations for good or for ill. What’s more, even though my own experiences with this company were entirely positive, I’ve included a note of warning at the beginning of this review to reflect the many tales of woe shared in these comments. I feel this is a far more appropriate action than to simply remove the review entirely per your suggestion. I, too, have fallen victim to this scallywag. Ordered a hat in February 2011 for my husband’s birthday present. Received the order confirmation promptly. 9 weeks had passed, no hat. I have sent several emails, no reply. Then I found this string of comments. My heart sunk, and I wish I had seen this first. I have sent a complaint to the BBB, but that is still pending. Does anyone have Pyrate Letherworx phone number? They still haven’t responded to any of my email inquiries and it has been ten weeks. And to the Bilge, you should put a stronger warning on the main review. Pyrate Leatherworx is ripping people off. It is now going on fourteen months and still no hat inspite of numerious email promises of ‘next week’ that have amounted to nothing more than flatulence. Sorry to have to say that Pyrate Leatherworx has turned out to be a no-load merchant and should be avoided by the pirate community. I’d like to throw my 2 pieces of 8 into the mix on this one. I recently had dealings with the Pyrate Trading company. I had ordered a hat back in March while I was deployed with the Military to the horn of Africa (yep, the Somali Pirate coast). After returning home in late April I thought that I’d have a hat either waiting on me or arriving shortly after. Much to my chagrin, it did not…so I started emailin’…and emailin’…and emailin’. I found this page and review in late May and my timbers began to shiver. I had chosen Pyrate Leather due in part to their being local, as well as what appeared to be a nice looking product. My experience was beginning to be very similiar to what others have described above: a few apologetic responses and a slew of promises. I wasn’t sure what exactly would be the outcome, but I got the sense that the Pyrates (Clay at least), truly did want to to fulfill the bargain but was under the gun and completely swamped. Yesterday, he hand delivered my awesome hat. I’m pleased to report that in spite of the tardiness of the order, the quality is completely fantastic. Clay kept to the code and refused to sacrifice craftmanship for speed. He plans to post an advisory note letting folks know that the wait will be a bit longer than previously expected. I hope that others in similiar straits will take heart from this and will soon be sporting their own great looking hats. Yea they ignored my emails to ;[ ordered the barbossa from them and still nothing. Plus the phone number does not work. I hope they did not steal from me! D: I want my hat so badly! Contact PayPal or your credit card right away. I’m trying to work with PayPal, but not having much luck. The longer you wait, the harder it gets. However, any of you that haven’t got their hats, contact PayPal, even if you aren’t a member, and tell them your story. It gives more credence to our stories. Their phone number is 402-935-7733, customer service is 402-935-2050. They may be able to resolve this situation, but don’t hold your breathe. Report them to paypal. I contacted them and they said if they get enough people there gonna issue every ones money back. After being so frustrated with the way I was treated on the phone when I contacted my credit card company about this issue, I sent a letter to the customer service department explaining the situation. I included a copy of all the emails I sent to Pyrate Letherworx, and I, also, threatened to use the credit card very minimally and would not ever use any of their loan products. Customer service responded, and have credited all the money back plus some interest(?). When I talked to the manager, she said seeing the email chain of contact really helped. So keep at it with PayPal and your credit card provider. Fair winds Mateys…….. I Finally Receive my Hat 1 1/2 after ordering. I was expecting a great Hat considering the time frame. Its a ok hat. It is so stiff Its like wearing a box on my head. I am unable to wear it. Did not contact Seller. Im done with them. I did get a free gift of a interesting Ceramic mug. Its in my tv room… the hats I think is in the closet somewhere. Love Ya Bilge! Thanks for the forum! one answer, 3 weeks ago plus ten months of silence.. they tried to take time i believe… should i have a party for the birthday of my pending order? Captain Jack filled his order in 2 months and that was after the first hat went astray in shipping. Jas. Townsend & Son took all of 3 weeks to fill my order. Hummm… If ths many folks are losing money perhaps charges can be filed through the government for interstate fraud, and IRS for tax evasion for not claiming the profit on unshipped goods. If you guys want your money back contact the Attorney Generals Office of Kansas. They said there getting my money back because something up. Contact them! They said im the only clam! I have to say I have had nothing but great service and excellent quality of merchandise. I have purchased several hats from them and they were forthcoming on getting back with a timeline. I think they are a better maker of hats than the ridiculously over priced “Captain Jack’s” any day. One hat was more than enough to realize I don’t want another from Jack.